We love to see you all enjoying science…that’s why we do science parties, camps and visit schools all year round! We like to see that ‘wow’ moment when kids see the awesomeness of science. However, experimenting shouldn’t stop when you leave a Fab Science event, that’s just the start! We’ve given you some ideas of activities you can try on our Home Science page and we know you have loads more ideas of your own. Please share them with us…and you could win a Fab Science goody bag! You could take a photo or video of yourself trying out an experiment or visiting a science museum. You could send us a picture of something that you have created or an interesting find. 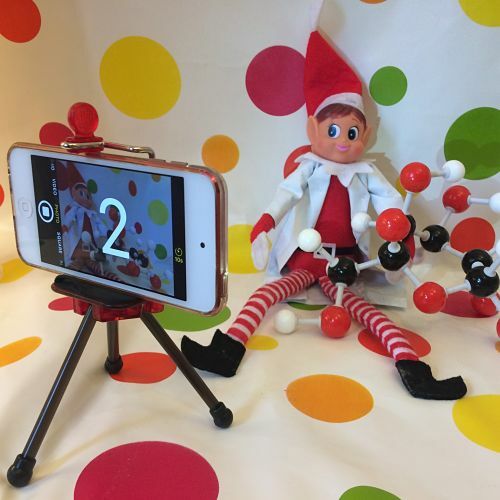 You could even do an ‘elfie’ instead of a ‘selfie’ and get your elf doing experiments like Whizzy, the Fab Science Elf! Feel free to add captions or comments explaining what your selfie or elfie is all about. We now have a Facebook group set up specially for sharing your science ideas, or tag @fab_science in your Instagram science selfies and use the hashtag #FabScienceSelfie. To be in with a chance of winning, you’ll need to post your photos or videos by the end of December. If you prefer you can email them to selfie@fabscience.co.uk instead. We can’t wait to see what you will think of! There will be one prize of a deluxe Fab Science goody bag and two runner up prizes of standard goody bags (shipping to UK addresses only). The Fab Science team will decide the winners based on creativity, fun, interest and scienciness (if it isn’t a word, it should be!). Any images or videos posted to the Fab Science Facebook group or using the #fabscience hashtag during this competition may be used by Fab Science for marketing purposes. Please make sure you have the consent of anyone in the photos (or parents/guardians) for them to be used in this way. Entries must be received by midnight on Monday 31st December 2018.
previousYou are what you eat!